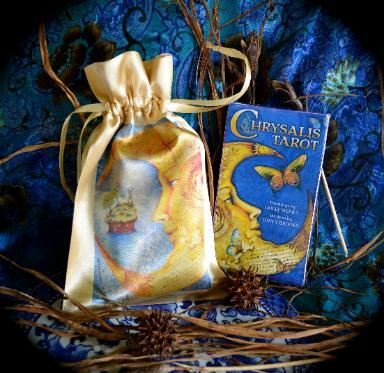 Chrysalis Tarot is a whimsical tarot deck reminding me of a children book. While based on Rider-Waite 78-card layout, it’s a non-traditional deck, with which authors Toney Brooks and Holly Sierra bring a fresh, metamorphic approach, focused on self-development and finding helpful guides from an invisible world of archetypes ultimately benevolent and uplifting. There is a feeling you are inspired and advised by a group of close friends when you ask your questions to this deck. The symbolism is international and eclectic and most original Rider-Waite card associations are replaced with a new outlook. The court cards are no longer kings, knights and queens, but as the author calls them, “a delightful ensemble of medieval merrymakers”: Healer, Mime, Artiste, Sojourner, Corsair, Pilgrim etc., all universal archetypes inspiring and guiding you on your journey. Each card is explained with love and profundity, and what I like the most is how the choice of colors is also meaningful, thoughtfully chosen, serving as an additional interpretation guidance apart from the figurative imagery, and there is an additional advice from the authors to pay attention to the colors in each card and how they open different layers of your mind: intuition, compassion, freshness of new beginnings, etc. Even the more difficult moments on your journey with this deck are seen as important part of turning from a chrysalis into a butterfly, and this deck is able to inspire you to see these moments as growth-oriented, rather than menacing. There is this feeling while working with this deck that you have your own peer group of archetype people, animals, mythological creatures, deities, sometimes scolding sometimes cheering, but loving you, and you feel among family with the cards. You feel the child that you were, now finally ready to see again, as you did before, that the world is a magical place and our life a fairy tale. Despite the gentle and loving cards, the deck offers deep insight with all questions and it doesn't shy away from the truth. "Tarot is about achieving your destiny; that co-creative, co-operative, maddening march through life filled with chance, chicanery and choice. The pursuit of personal destiny is a struggle to find inner peace, to find balance between an ego that wants and takes and a psyche that allows and gives. In modern times, as tarot became associated with mysticism, divination and magic, users noticed the cards’ uncanny ability to flesh out future possibilities. Tarot’s illumination of your psyche is a vital component in the art of lis­tening to your internal voice, raising self-aware­ness and informing decisions. We invite you to browse through the Chrysalis Tarot cards. You’ll find familiar and unfamiliar trump cards making up the Major Arcana. These 22 cards numbered 0 to 21 represent Oth­erworld characters and archetypes. Next up, the 40 Pip cards, numbered Ace through Ten in each suit, feature scenes that inspire personal reflec­tion and stimulate your psychic intuition and imagination. The four suits that make up the Minor Arcana are: Stones (Pentacles); Mirrors (Cups); Spirals (Wands); and Scrolls (Swords). Finally, you’ll see we have replaced the tradi­tional 16 Court cards with a fun-loving troupe of medieval troubadours. These merrymakers represent real-life messengers inspired by the Otherworld to assist you, especially at critical moments and troubling crossroads. Tarot invites questions, inspires the mind and whisks you on an adventurous journey within, a journey that is revealing, informative and fun. We trust it will be as fruitful as those journeys that led us to imagine and create this unique tarot deck."